JH: Something fun and informative today, as Alythia Brown returns to the lecture hall with her Grammar Chicken. Yes, that's right. A chicken that helps writers keep track of commonly misused words. Believe it or not, those are two of my favorite things (Well, chickens, and helping writers). 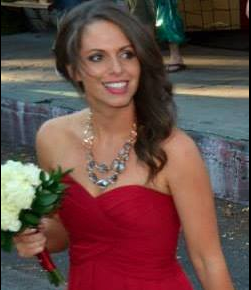 Alythia Brown is represented by BookEnds LLC and works by day as a journalist and copy editor. You can find more of The Grammar Chicken. I was a novelist before I became a newspaper journalist and copy editor, and if there’s anything I’ve learned from the latter, it’s that questioning everything will take you far. As a novelist, I kept an eye out for the basics – spelling errors and structure – but mainly I was focused on telling the story and crafting beautiful sentences. My day job as a copy editor for the paper opened my eyes to how often adults misuse everyday words. Countless press releases (from professionals paid to write them no less) end up on my desk full of mistakes and inconsistent style. I got into the habit of questioning everything. Coincidentally, it made my creative writing stronger. While I use the Associated Press style guide at work, novelists (aka comma lovers) tend to adhere to the Chicago Manual of Style. Many publishers will employ a “house style” that mainly follows one style guide with particular rules of their own. But no matter the guide, consistency is key. Whether you’re writing for a magazine or trying to snag the attention of a literary agent, purchasing a style guide and getting into the habit of asking yourself questions to which you thought you already knew the answers will result in a cleaner, more professional product. Below are some commonly misused words and the chickens who explain how to use them. 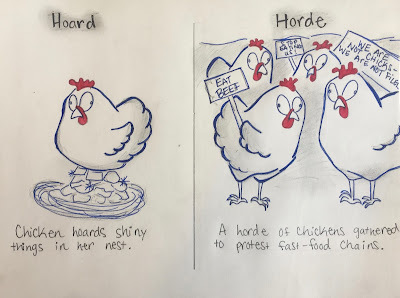 What’s the difference between hoard and horde? Hoard (n.) refers to a stash of money, goods or otherwise valued objects. 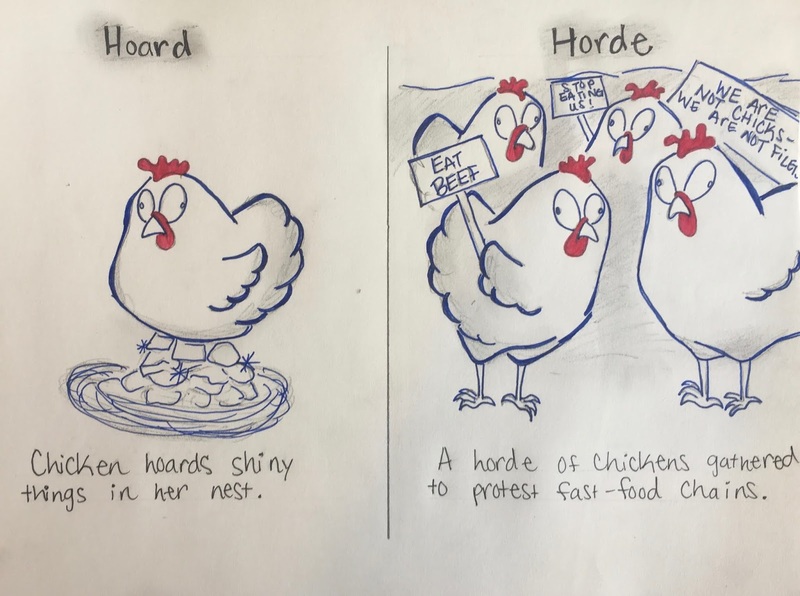 In this case, Chicken hoards (v.) the hoard (n.) of shiny things. So you see it can also become a verb. A horde technically refers to a group of people, but since this isn’t The Grammar Person, I took creative license with this definition. Those in the UK tend to like that extra letter and spell it towards with an S. I’ve noticed many Americans still pronounce the S in everyday conversation (hence the confusion) but it is not used if you’re writing for a U.S. publication – whether it’s a newspaper or a book publisher, both the AP Style Guide and the Chicago Manual of Style note to leave it off in all cases. The same goes for forward and backward. Picking up a style guide and getting into the rhythm of looking up everything will help you polish your manuscript so it looks more professional. And literary agents and editors like working with professionals who take their work seriously. Alythia, I've been so confused about when to use "a while" and "awhile" I was just going to let an editor tell me where I am right or wrong. However, that small trick you gave is going to help tremendously. Thank you. well, backward/s and forward/s are up for debate. In English English the "s" is there. You can be a backward child or a forward young man but my car is going backwards or forwards.